In Villages of Valeria, you take on the role of a Baron in the vast and beautiful kingdom of Valeria. Construct magnificent buildings, cultivate resources, and attract adventurers in order to become the next capital city of Valeria. 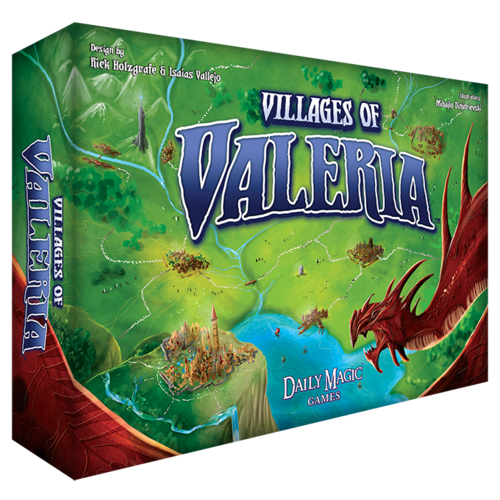 Villages of Valeria is a stand alone game set in the world of Valeria and takes place just before the hordes of monsters invade the kingdom in Valeria: Card Kingdoms. The Kingdom has been established and the King is looking for the greatest Village to name the next capital city of Valeria. In order to accomplish this, you'll have to outwit your fellow Baron's by selecting the best actions and making sure to follow your opponents actions as best you can. DEVELOP: Discard 1 card to add a Card to your Castle as a Resource. Follow: You may discard 2 cards to add a Card to your Castle as a Resource. BUILD: Place Gold on Resources to add a building to your village and draw 1 card. Follow: You may place Gold on Resources to add a building to your village. RECRUIT: Pay 1 Gold to add an Adventurer to your village. Follow: Pay 2 Gold to add an Adventurer to your village. TAX: Collect 1 Gold and draw 1 Card.